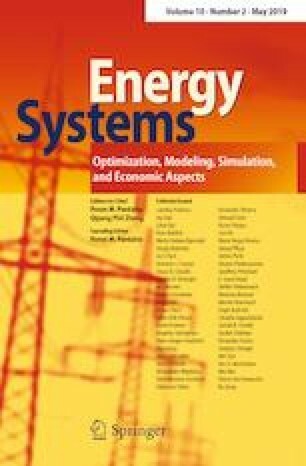 This paper presents a simulation study of standalone hybrid Distributed Generation Systems (DGS) with Battery Energy Storage System (BESS). The DGS consists of Photovoltaic (PV) panels as Renewable Power Source (RPS), a Diesel Generator (DG) for power buck-up and a BESS to accommodate the surplus of energy, which may be employed in times of poor PV generation. While off-grid DGS represent an efficient and cost-effective energy supply solution particularly to rural and remote areas, fluctuations in voltage and frequency due to load variations, weather conditions (temperature, irradiation) and transmission line short-circuits are major challenges. The paper suggests a hierarchical Power Management (PM) and controller structure to improve the reliability and efficiency of the hybrid DGS. The first layer of the overall control scheme includes a Fuzzy Logic Controller (FLC) to adjust the voltage and frequency at the Point of Common Coupling (PCC) and a Clamping Bridge Circuit (CBC) which regulates the DC bus voltage. A maximum power point tracking (MPPT) controller based on FLC is designed to extract the optimum power from the PV. The second control layer coordinates among PV, DG and BESS to ensure reliable and efficient power supply to the load. MATLAB Simulink is used to implement the overall model of the off-grid DGS and to test the performance of the proposed control scheme which is evaluated in a series of simulations scenarios. The results demonstrated the good performance of the proposed control scheme and effective coordination between the DGS for all the simulation scenarios considered. Inductor of bidirectional DC-DC converter. This work has been supported by Electrical Engineering and L2GEGI laboratory at the Tiaret University, Algeria in collaboration with Polytechnic national school, Algiers, Algeria. See Tables 4, 5, 6, 7, 8, 9, 10, 11.